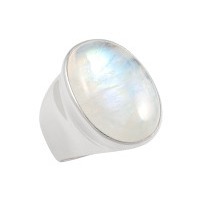 Introducing Rainbow Moonstone, the cool gem with an inner glow. Read on to learn how the mineral forms, how its light display is caused, and why it is known for engendering inner peace and harmony. Chemistry: (Ca,Na)(Al,Si)4O from the plagioclase feldspar group. To understand rainbow moonstone, one must first come to terms with the fact that this mineral is more closely related to labradorite than it is to what is traditionally known as moonstone. 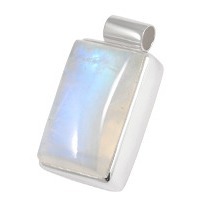 In fact, rainbow moonstone is white labradorite. The confusion (or falsification, depending on which way you look at it) arises for two reasons. The most obvious reason is that white labradorite’s flashes of blue and rainbow colours resemble that of quality moonstone. The other reason is that both labradorite and moonstone belong to the feldspar group of minerals, and are chemically and physically very close. Moonstone is an orthoclase feldspar, while labradorite is a plagioclase feldspar. Rainbow moonstone is an intermediate to calcic plagioclase feldspar, the meaning of which we will define below. Feldspars are the most abundant mineral on earth, and literally translate from the Scandinavian words, Feld (field) and Spar (easily cleaved material). Essentially, they are aluminosilicates (ALSi3 O8) that crystallize in igneous (volcanic) rock, forming flattened, tabular crystals. Plagioclase refers to a whole series of feldspars that are in fact solid solutions. A solid solution is a mineral within which another or other elements have been dissolved and evenly mixed in when the minerals were in molten form at high temperatures (say, during volcanic activity). Upon cooling, the mineral crystallizes and hardens, and the dissolved elements remain interspersed within the crystal lattice of the mineral. With plagioclase feldspars, the elements dissolved within the mineral’s crystal structure are either Sodium (Na), Calcium (Ca), or a combination of both these elements in varying proportions. In rainbow moonstone’s case, both Calcium and Sodium are present, with Calcium comprising between 50% and 70% of the dissolved elements, and the balance being made up of Sodium. As the molten mix cools, the Calcium, which solidifies at a higher temperature than Sodium, crystallizes first. This causes the elements to separate into layers within the feldspar lattice as they cool. These layers are known as lamellae and are responsible for the light play that makes rainbow moonstone so special. Rainbow moonstone is translucent to opaque white and, depending on the angle at which it is viewed, reveals flashes of light. On occasion the light revealed may simply be white, but any colour of the spectrum is possible, from gold through to red, violet and blue. It is not uncommon to see rainbow hues reflected as well. This phenomenon is known as schiller. It occurs because of the passage of light through rainbow moonstone’s layers (or lamellae). As the light passes through, it will be scattered and refracted each time it hits a new layer. The number, thickness and angles of the layers will determine how the light is refracted and how much will be reflected back. 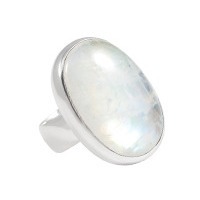 Rainbow moonstone’s energy is decidedly feminine and relates to the lunar principle. This is a stone for inner peace and harmony and engenders joy, confidence and optimism. It is considered to possess a very gentle, calming and grounding energy that helps to heal emotional wounds, overcome grief, shock and trauma and cope with stress. It empowers the feminine aspect in oneself and enhances intuition, while also clearing the aura and strengthening and affording protection on the psychic level. 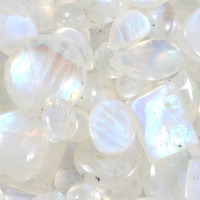 Rainbow moonstone is also credited with creating compassion and empathy. It is said to be an aid for lovers, allowing couples to better understand each other’s feelings, and promotes a healthier relationship. For this reason, it is recommended as a gift between lovers. There is no reason why it would not be beneficial for the whole spectrum of human relationships. 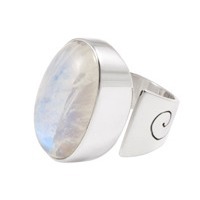 Physically, rainbow moonstone is credited with alleviating menstrual discomfort and balancing the hormones. It is also said to calm hyperactive children, to prevent sleepwalking and to cure insomnia. It is recommended to keep a stone under ones pillow to invite a good night’s sleep.